A man who tortured a neighbour's dog over three days in a "sustained and callous" attack has been jailed for four months. Shaun Furgusson, 24, of Wansford Grove, Hull, snatched mongrel Chrissie before kicking her, smashing five of her ribs and cutting off one of her ears. He later told her owner he had found her missing pet in a nearby garden. 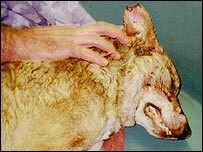 Furgusson admitted causing unnecessary suffering and failing to ensure the dog received proper veterinary treatment. He first pleaded guilty to the charges on Tuesday, but fled the court before sentencing. Appearing again on Wednesday, magistrates imposed a four month sentence for the original charges and an additional two months for fleeing court. District Judge Helen Cousins said: "This was a sustained, brutal and callous attack on a defenceless animal." Magistrates heard Furgusson broke one of the dog's legs and bound it with wire before smashing her teeth and shattering her skull with a hammer. But he denied having seen the dog when asked by her owner, Tracy Bainbridge. He later called Ms Bainbridge to say he had found Chrissie in the garden of a derelict house nearby. The dog was still breathing when Ms Bainbridge discovered her next to a blood-stained flag but she later died in her owner's arms. Outside the court, RSPCA inspector Simon Manning said he was delighted the maximum sentence had been imposed. "His kitchen resembled a slaughterhouse, with blood everywhere," he said. "Not only did he torture the dog but he tortured the owner."